NZ Gutter Protection Leafmesh is exclusively manufactured in Australia to our specifications for New Zealand conditions. The mesh is 100% virgin high quality extra heavy duty polyethylene. It is UV stabilised, and specially designed to maximise water collection and is completely safe. NZ Gutter Protection Leafmesh has proven to be the most durable and effective method of protecting your gutters and drainpipes from blockages, as well as stopping unwanted intrusion from birds and pests. As mentioned above NZ Gutter Protection Leafmesh is made from a high density, Industrial Grade Polyethylene 2.2mm thick with construction holes approx 3.0mm by 3.0 mm across. The mesh is UV stabilised to give you an estimated 20-25 years of maintenance free service under the harsh New Zealand sun. It fits most roof types and gives gutters an elegant streamlined look. Do I need to maintain NZ Gutter Protection Leafmesh? No! That’s the best part – NZ Gutter Protection system is self cleaning in most situations. Its rugged polyethylene construction means that it will not rust or cause electrolysis (oxidisation) and is therefore maintenance free. How does NZ Gutter Protection Leafmesh look on the roof? Often it can’t be seen. It comes in a range of colours to blend into your roof. See our range of colours below. 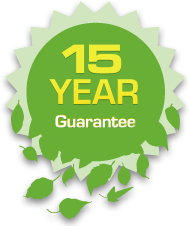 What sort guarantee does NZ Gutter Protection offer ?